Lego Eiffel Tower: Will It Bring The Paris Experience? For decades, kids and adults alike have played with Lego to make the most out of childhood and to relive the younger days, respectively. For some adults, sometimes they would want to regress some more and get back on playing these building blocks. Fortunately, for those same grown-ups who would want to experience both Lego building and the chance to experience Paris with their sweetheart in a relatively small scale, the Lego Eiffel Tower exists for that purpose. This structure is a 3.5-feet landmark recreation of a legendary classic that has features to enables its purchasers to build a 1:300 scale of a Lego-style Eiffel tower in the convenience of their own house. It includes 3428 pieces of durable Lego plastic and an instruction manual for the whole building process. The completed model measures 20 inches in length, 20 inches in width, and 42.5 inches in height. This model is recommended for 16 years old and above. With all these specifications about the product, would this be enough to bring the Paris experience to its customers? Even for something as simple as building a structure made of Lego, there is one thing that marks the highlight of this product. The best thing about this replica is its accuracy, in a cute and Lego-ish kind of way. Although the whole product seems a little rough around the edges, it has its own unique accurate representation of the tower. The final output looks absolutely gorgeous and eye-catching after finishing the construction of the whole structure, especially with its 42.5-inch height. The beauty of the whole completed building is almost comparable to the appeal of the real Eiffel Tower, making it one of the best Lego recreations of all time. Another thing that makes this product worthwhile is its instruction manual. The manual is very easy to understand and predict unlike most models that would require the same kind of construction. The age requirement of 16 years old is spot-on due to the complexity of the product’s construction that is appropriate for the age range. The educational experience that this product provides is really helpful especially for children near the recommended age requirement. It is fun to build with many friends, and it can even be a romantic experience for couples who would want to spend time inside the house other than seriously intimate stuff. The product is worth every penny with all the features it has in store. Although the product has a lot of interesting features, one minor flaw puts it down a half-step lower. Although every single piece is durable, the design is not. 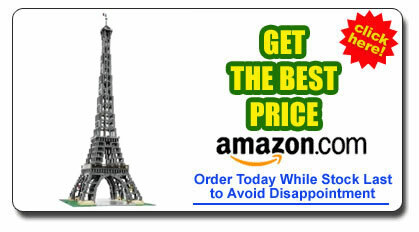 This is because the top and the middle parts of the full Eiffel tower are separate. This means one small bump on the top part would break the whole tower other than the base. This could be solved by gluing all the separate parts together; however, the pure structure of the tower would be compromised. The Lego Eiffel Tower is an amazing package that has features to create the one of the best recreational activities that involves France. Despite its minor shortcoming of being easily breakable, the tower can hold its own against criticism with its adorable appearance, strong focus on bonding and recreation, and easy-to-decipher manual for quick construction. It is a surely structure that is sure to bring the Paris experience inside one’s home in the form of a Lego collection.